“Have you thought about what you want to do for your birthday?” my mom asked. Again. “I don’t know, Mom!” I said, an edge of my 16-year-old self surfacing. I’ve been grinding my teeth about turning 40 for at least the last year. The closer it got, the more I talked about it. It became a frequent topic of conversation, as ever-present as politics (if I followed them) or a bride’s impending nuptials. I talked about it, fretted about it, and squinted as two of my friends passed the milestone, seemingly unscathed. As a gift to myself for this milestone, I booked a trip to a blogging conference that began the day after my birthday. But what I didn’t do was plan something for the actual day. This particular anniversary of my birth fell on a Thursday. The kids would be in preschool, which was nice. But my friends and husband would be working. Spending the day by myself sounded depressing, but I wasn’t sure what the options were. I could book a spa day, or go yoga-class-hopping, or even take a nap! But none of those ideas felt quite right. What I really wanted, I realized, was someone to plan something for me. I wanted someone to step in, knowing how big of a deal this day felt to me. I wanted them to plan the perfect thing—whatever that was—that would make me feel loved and appreciated. I’m not sure why 40 feels like such a big deal, but it does. I think it’s partly that there’s no escaping that, if I’m quite lucky, my life is somewhere around halfway over. It’s the real deal – this is my life. Forty is firmly middle age, which seems impossible. Surely, most middle aged people have learned to cook, mop, and feel entirely comfortable in their own skin. I still feel barely grown. I don’t even have a proper raincoat or an umbrella – how could I be middle-aged? I was out for a run one day (and by run, I mean walking with small intervals of jogging in between). There is something about moving my body that allows my mind to roam free, and this often generates creative sparks or epiphanies. The words cruised through my head: I am almost 40. This is my life. 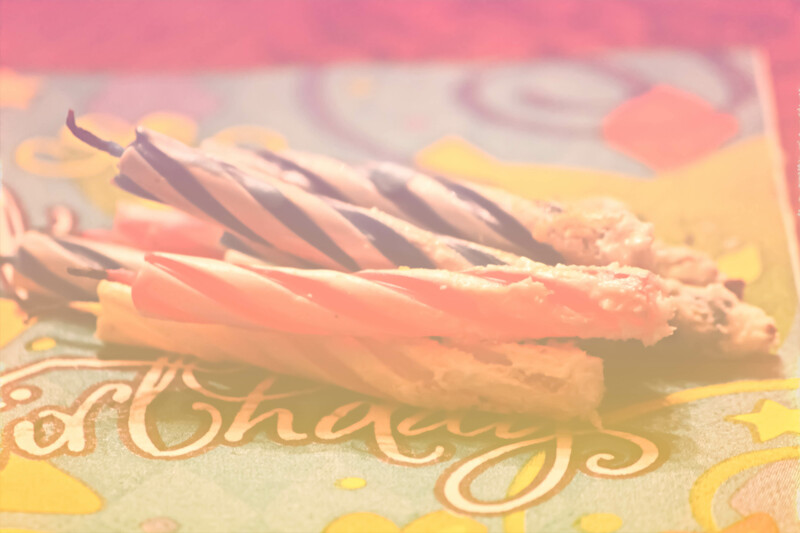 I could putter around and say, “I don’t know,” and wait for someone to plan something for my birthday, which seemed unlikely as the day got closer. Or, I could figure out what it was that I actually wanted and see if it was possible. It wasn’t that I wanted a giant party—I’m an introvert, and giant parties turn me into an overstimulated zombie. I didn’t want a limo or a big surprise. But I did want company. When I got home from my walk, I texted three of my besties and asked if there was any way that they could meet me for breakfast or lunch on my birthday. I tried to brace myself for the potential disappointment if they couldn’t do it—after all, they all had to work that day. But pretty soon the texts started rolling in. To my delight, two could meet me for lunch and one for breakfast. I asked my husband if he’d come to the local “foot sanctuary” with me and get a shoulder massage. He said yes. And, finally answering my mom’s question, I decided my family would go out for dinner that night. My realization seems obvious but it took me, well, 40 years to figure it out. If I want something, I need to ask for it. It’s what happened with my writing over the last year: I’ve written, and I’ve asked people to publish my words. Some have said no, but a surprising number have said yes. And the day was lovely. I scooted out of the house early to meet a friend for breakfast. Over eggs and coffee, we talked about our kids and turning 40. We talked about our wild 20’s and how we hope our kids will always feel they can talk to us. I soaked in simple pleasures: talking with a mom friend without our kids’ interruptions. Biting into a golden egg yolk. Sharing alarm at the velocity of time with a dear friend. A few hours later, I met my friends for lunch, and the rain frizzed out my flat-ironed hair, because though I was indeed officially 40, I still had not procured a raincoat or umbrella. While waiting for a table, I stared hungrily at a newborn baby snuggled into his mother’s arms. My ovaries throbbed, and I thought of my little munchkins, and how hard it was when they were babies, but how gone that era was now. I watched the baby’s little pink lips and I thought about how nice it was to have the freedom I have now that my kids are slightly older, and I tried to ignore the contractions in my uterus. My friends arrived, one of them with the soft beginning of a baby bump. I felt happy for her, and a little bit sad that my own time with babies was over. Really, it is also how I felt about turning 40 – a little bit weepy that my thirties were gone, but excited to see what my 40’s bring. We chatted and ate, and my friends both gave me lovely cards that made my heart swell. Next, I met my husband for our foot soak and massage. We soaked our feet in hot frothy water and had amazing neck and shoulder massages where we both had to ask the masseuse to lighten up her firm touch ever so slightly. I went first and then as my husband enjoyed his massage, I sipped a sweet, hot mug of chai. I ran the tip of my tongue along the sugar crystals on the rim of the glass. I felt the pressure of the warm shoulder wrap where the masseuse’s fingers had just been. I looked at my husband’s face, so relaxed, and I smiled before sinking back into myself, taking in the conversations of other patrons, including the annoying, loud twenty-somethings in the corner who were chattering on about dates with midgets. I thought, I am glad to be forty. My twenties were hard. They were so full of loss and being lost. I thought I am so glad to be where I am. Dinner with my family was slightly less successful. My children whined their way through dinner, and we did the walk of shame out of the restaurant with them, trying to ignore the other patrons’ stares. I asked my son to please calm down, but sometimes when you ask for what you want, you don’t get it. After dinner, we all returned to our house. I opened my generous, thoughtful gifts: my mom had a beautiful grey star sapphire ring made for me to replace a favorite ring that I’d lost, with all that other loss, in my 20’s. My husband gave me a year’s membership to my favorite yoga studio. The gifts were lovely, and I am so grateful for them. But mostly I’m grateful for the people that shared my day with me, and for the lesson I learned about asking for what I want. I asked, and, with the exception of my kids at dinner, I received it. My life is mostly the way I want it to be: I have a beautiful, loving family and amazing friends. I’m writing. I’m healthy. This is it. This is my life. And I’m so lucky. Sounds like a wonderful birthday! I am nearing my 40 and honestly yours sounds just how I want to celebrate mine. Lynn, This brought tears to my eyes. You are beautiful inside and out, girl. Forty won’t change that. 🙂 It was great to meet you. Oh, thank you so much, Lisa! I’m so glad we met, and I’m really enjoying your blog!